I was a dispatcher for 20 years and we hardly ever received any recognition. So when I was recently hired as the 9-1-1 Coordinator for Huron County, I vowed to change that practice. 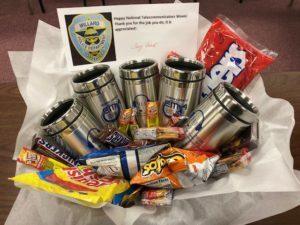 We have 4 PSAP’s and I decided to make goodie baskets for each PSAP. I had thermos mugs made up with our logo and a 9-1-1 headset with National Telecommunicators Week imprinted on them. Then I filled each basket with various snacks and goodies for the dispatchers. Hopefully they know I appreciate the job they do and I am here to assist them in any way possible!